Tesla has updated its design studio to include a 21″ Black Arachnid Wheel option for the Model S P100D, along with front ventilated seats for both Model S and Model X in the high-performance trim. Though the 21″ forged aluminum Arachnid wheels have been available for nearly two years since May of 2016, they were not available for purchase and attainable only through Tesla’s referral program. Owners referring five or more qualifying sales of a Model S or Model X were awarded a set of the lightweight, high-performance wheels, available in the color silver, grey and black. Tesla is offering the Arachnid wheel only in the color black to Model S P100D buyers looking to tack on an additional $4,500 to the price of its flagship sedan and winner of Motor Trend’s “World’s Greatest Drag Race”. In addition to the Black Arachnid Wheel being made available as an option for purchase through Tesla’s online configurator, the company is also bringing back ventilated seats. This option is only available in the P100D premium packages for both Model S and Model X, and a feature that’s designed with small vents for circulating air and keeping the front seats cool and dry. Tesla offered ventilated seats before they quietly discontinued them in early 2017. 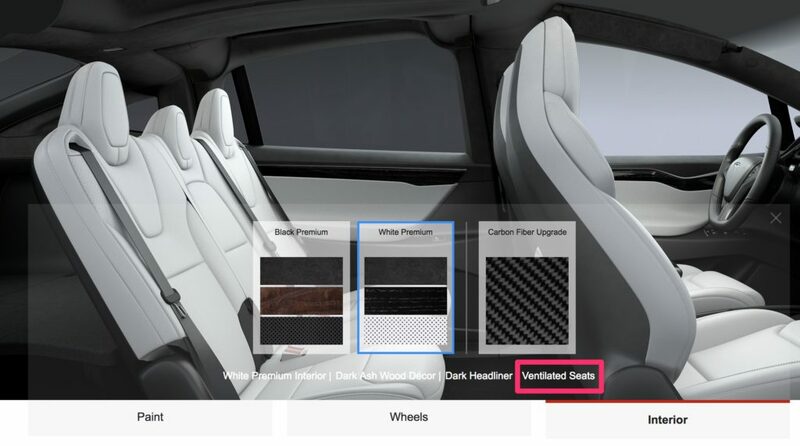 The seats were first introduced in the Model X before becoming an available option for the Model S. There was no official comment on why the option was removed. However, owners were wary if the upgraded option actually worked. Tesla was also trying to streamline its production at the time to make it cheaper and quicker to produce cars. Hopefully, the seats will work better this time around.